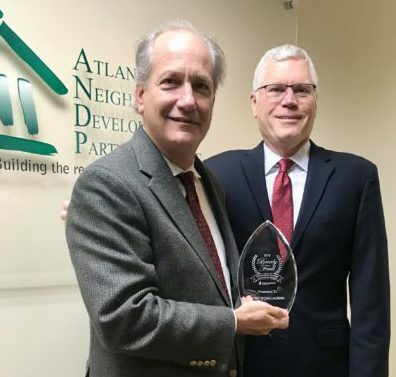 Atlanta, GA, January 15, 2019 — Down Payment Resource (DPR) is proud to announce John O’Callaghan, President and CEO of the Atlanta Neighborhood Development Partnership, Inc. (ANDP) as the first recipient of the Beverly Faull Affordable Housing Leadership Award. The award, named in memory of accomplished real estate veteran Beverly Faull, recognizes an individual who has demonstrated leadership in providing more access to homeownership and affordable housing finance solutions. As a well respected veteran in the MLS and housing industry and one of DPR’s first employees, Faull believed in the company’s mission to provide greater access and awareness to down payment assistance programs. Faull was responsible for building DPR’s MLS business and putting its tools in the hands of more than 300,000 Realtors across a dozen MLSs. O’Callaghan has decades of experience advocating for affordable housing in Atlanta and beyond. At ANDP, O’Callaghan leads the organization’s policy and housing development programs and also spearheaded a regional foreclosure response initiative that was awarded the National Housing Conference 2015 Housing Visionary Award. Rob Chrane, CEO of Down Payment Resource, presents the 2018 Beverly Faull Affordable Housing Leadership Award to John O’Callaghan, President and CEO of the Atlanta Neighborhood Development Partnership, Inc. (ANDP). O’Callaghan is honored for his positive impact on affordable housing in Atlanta. “We’re proud to recognize someone who is making a positive impact on housing in Atlanta. Under O’Callaghan’s leadership ANDP has been a model of how nonprofit organizations can serve and support the unique needs of their communities,” said Chrane. O’Callaghan has also served on the DPR advisory board for several years. “It is an honor to receive an award in Beverly Faull’s memory. She was of a pioneer in the housing sector. Her commitment to homeownership leaves a legacy that will continue to touch countless families. We share her commitment to increasing homeownership and treasure the work of Down Payment Resource,” said O’Callaghan. To learn more about O’Callaghan and ANDP, visit www.andpi.org/about. 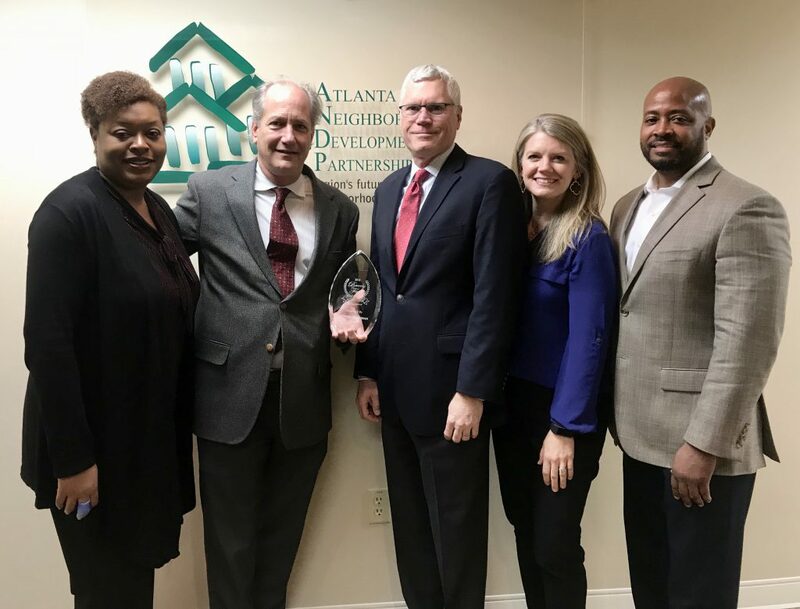 Down Payment Resource (DPR) presents inaugural Beverly Faull Affordable Housing Leadership Award to John O’Callaghan, President and CEO of the Atlanta Neighborhood Development Partnership, Inc. (ANDP). Left to right: Fern White, Account Manager, DPR; O’Callaghan; Rob Chrane, CEO, DPR; Tracey Shell, Director of Marketing Communications, DPR; James Cromartie, Special Initiatives Consultant, ANDP. Down Payment Resource (DPR) creates opportunity for homebuyers, REALTORS® and lenders by uncovering programs that get people into homes. The company tracks more than 2,500 homebuyer programs through its housing finance agency partners. DPR has been recognized by Inman News as “Most Innovative New Technology” and the HousingWire Tech100™. DPR is licensed to Multiple Listing Services, Realtor Associations, lenders and housing counselors across the country. For more information, please visit DownPaymentResource.com and on Twitter at @DwnPmtResource. « New Year, New Home?